If you are in any doubt about the purpose of the 2006 Audi A6 Allroad , just take a look at that front. 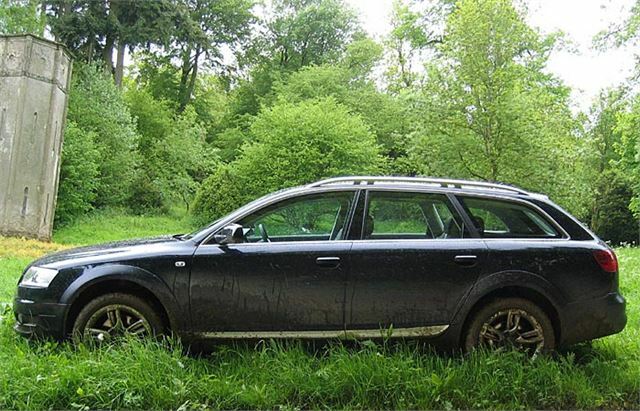 For a couple of thousand more than a standard A6 Quattro Avant SE (and for less than the S Line), you get the full hunting, shooting and fishing version with self-raising suspension and an useful 2,100kg towing capacity. One day you can be shooting grouse on the fells, the next day tugging a pony trailer across a muddy field and the next day (drought orders permitting) wafting your way up to a Congestion Charge in limo-like luxury. It’s the all-purpose country person’s car. As capable as some 4x4s off the road, and many times more capable on it. 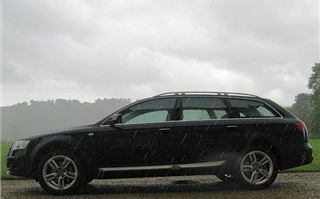 On the road, it drive and looks no different from an ordinary shooting brake, and the anti-4x4 brigade are so ignorant of what is and what isn’t a 4x4 you’re unlikely ever to get a ‘save the planet’ sticker stuck to your windscreen. 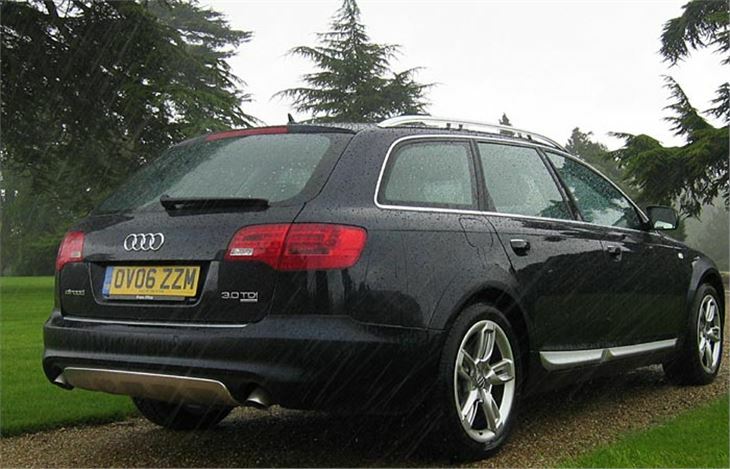 The A6 Avant is very favourably tested elsewhere on the site, though not the quattro versions which had not been launched at the time. 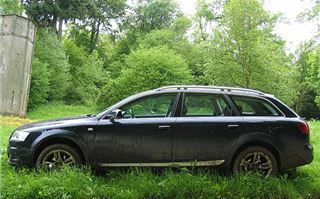 It’s a big, good looking, comfortable car with excellent 2.7 litre and 3.0 litre diesel engines (the 3.0 upped in power slightly), a 6-speed Tiptronic autobox (though you can have a manual Allroad 3.0TDI) and Audi’s easy to use ‘Multi Media Interface’ (intuitive i-drive) which also controls the height of the ‘adaptive air suspension’. I always judge these gizmos by how easy they are to use without having to RTFM. 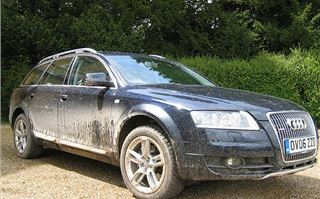 And the Audi’s quickly passed this test by guiding me logically to the suspension settings. It gives you a choice of ‘dynamic’, ‘automatic’, ‘comfort’, ‘allroad’ and ‘lift’. Dynamic drops the car to an equivalent of ‘sports suspension’, stiffening the ride and giving the best handling and fuel economy. It actually makes a significant difference, tightening the whole car up considerably. Automatic leave the system to choose. The car sits 15mm higher than dynamic in comfort mode, but drops to dynamic level once you stay at speeds over 75mph. The ride is more comfortable, but under 75 the car is noticeably more floaty, soggier and more inclined to understeer. 'Comfort' keeps the car in comfort mode. 'Allroad' lifts the car 50mm higher than dynamic and 35mm higher than comfort (to 175mm). Though once you pass 50mph it drops by 15mm and once past 75 by a further 20mm to the normal comfort level. Ideal for winter conditions on country roads and reasonably level gravel tracks. 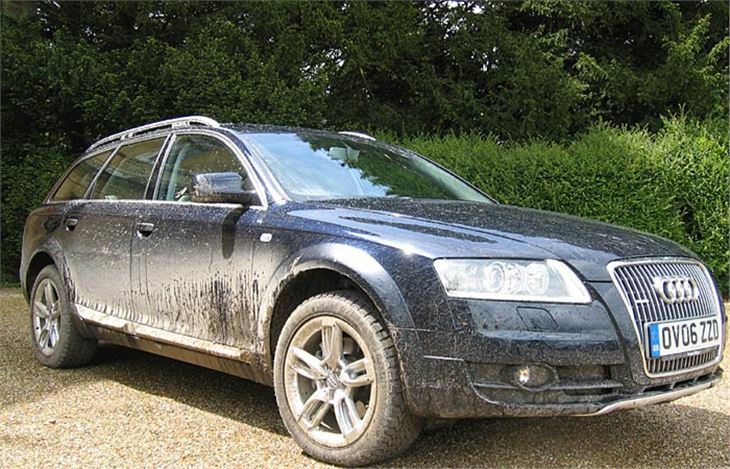 'Lift' takes it 10mm higher than 'Allroad' (to 185mm), but only at speeds up to 20mph because there is not so much suspension movement at this height. Go past 20mph and it drops back to 175mm. This is the setting for more serious off-roading, muddy tracks, and wet, spongy fields at point-to-point meetings. As well as all this the adaptive air suspension compensates for load at both ends of the car, pumping more air into the system to keep the car level (Mercedes E Class estates only have self-levelling air suspension at the back). I hope that explains the new Allroad. 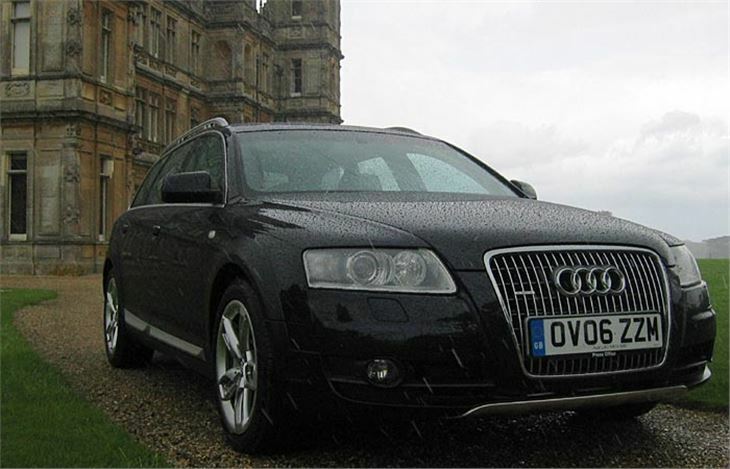 The rest of it is pure Audi A6 quattro Avant, which, with the 3.0 TDI engine seriously challenges the Mercedes E320 CDI for the title of best estate car in the world. Apart from full on 4x4 SUVs like BMW X5s, Porsche Cayennes and Range Rovers, its most obvious rivals are the Subaru Legacy estate and Outback and the Volvo XC70. But Audi has one up on these two by a brilliant example of product positioning. Audi sponsors the English Polo team. 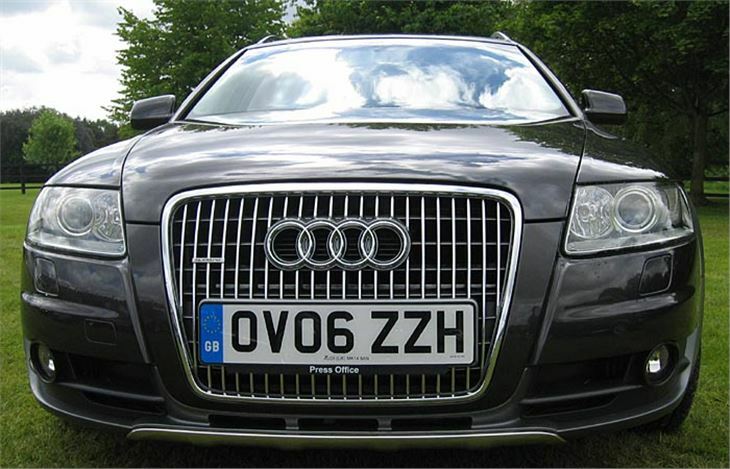 So if you need an estate car that is not only capable of all the above, but also sends out the right messages about its owner, then it has to be the one with the barbeque grille.